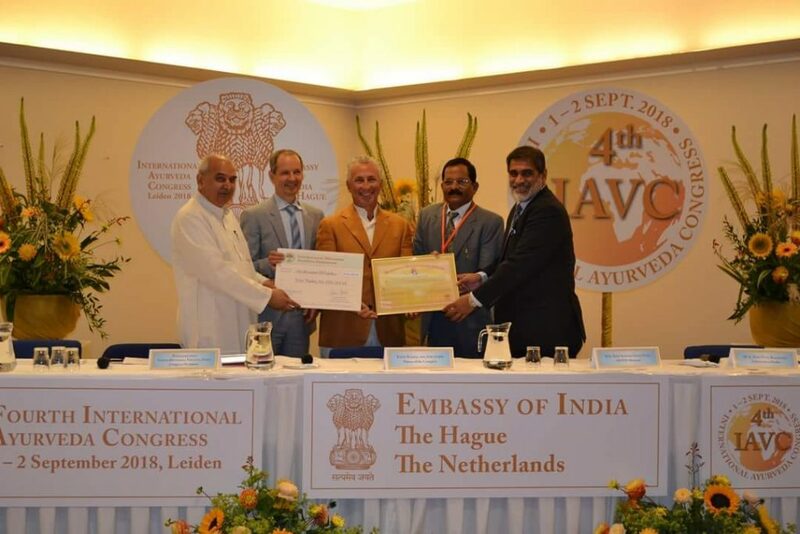 Press Release: Fourth International Ayurveda Congress and Ayurveda Health Fair, 1 – 2 September 2018 in Leiden. Korte Nederlandse samenvatting van dit congres en van het seminar daarna op 3 september 2018 door Gerrit Jan Gerritsma, arts. Bron: SDN, nieuwspagina, oktobernummer 2018, pagina 3. 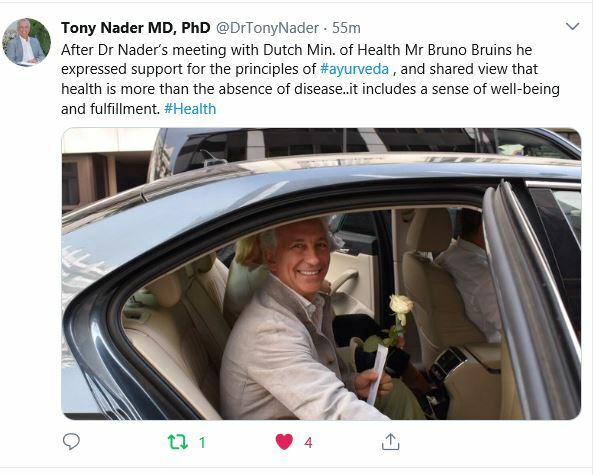 On Monday 3 September in Leiden the Dutch Minister for Health Care and Sport, Mr Bruno Bruins, shared a platform to discuss India-Netherlands collaboration in health care, including Ayurveda, with the Indian Government’s Minister for AYUSH, H.E. 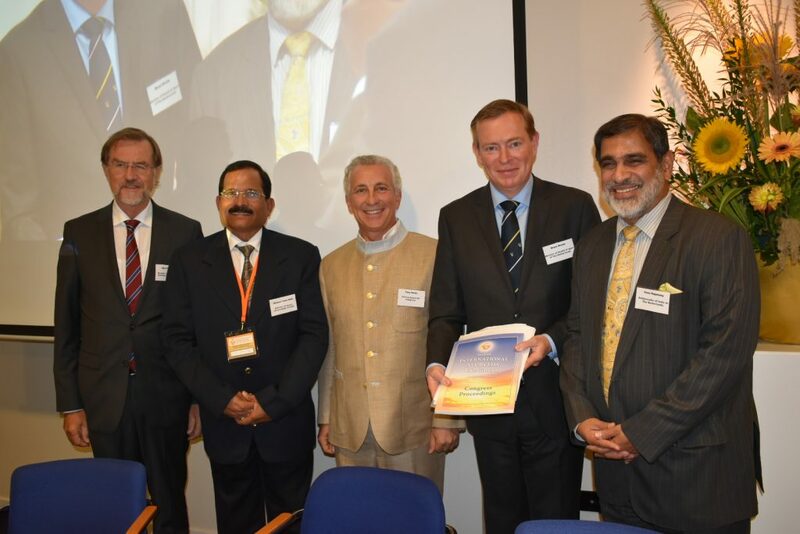 Shripad Naik, responsible for Ayurveda, Yoga, and alternative medicines in India (3nd left, remark webmaster), and Tony Nader (2rd on the left) MD, PhD, the Patron of the International Maharishi AyurVeda Foundation (IMAVF, first on the left). Ayurveda, the traditional Indian system of natural health care, has been enjoying a worldwide upsurge of scientific, medical, and popular interest for the last 30 years. 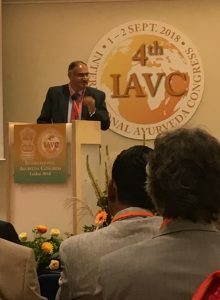 The seminar, arranged by the Indian Embassy, was the concluding event of the Fourth International Ayurveda Congress (IAVC), organized by the IMAVF, the Netherlands; the All India Ayurvedic Congress, Delhi; and the International Academy of Ayurveda, Pune. Mr Bruins (fourth on the left, remark webmaster) praised India’s innovation in the field of health care. He shared Ayurveda’s view that health is more than the absence of disease, but includes a sense of well-being and fulfilment, and its recognition that not all health problems require a ‘hard-core medical’ solution. 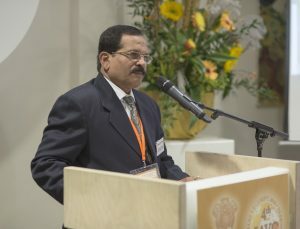 The Indian Ambassador to the Netherlands, H.E. Venu Rajamony, (first on the right and below) highlighted the importance of including traditional systems of medicine such as Yoga and Ayurveda in the West’s mainstream health care system, because of the benefits they can bring for health and longevity. Dr Nader spoke about the tremendous potential of AyurVeda for creating a disease-free society. He highlighted the usefulness of Transcendental Meditation as a technique for cultivating a rested state of mind and body, which supports better health choices and better health, as verified by numerous published scientific studies. ‘The mind and psychology have an influence on the nervous system. When you think a thought, experience fear, or have anxiety, this has an effect on your nervous system, which releases hormones influencing the immune system and the entire functioning of the body,’ Dr Nader said. 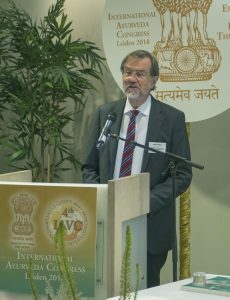 Mr. Alojz Peterle, MEP, Co-chairman of the Working Group for Health and Chairman of the Members Against Cancer Working Group in the European Parliament, and former Prime Minister of Slovenia, strongly praised Ayurveda for its scientific nature and completeness. “The fact is that health trends globally have been becoming more concerning for decades despite progress in medicine… all this leads to the conclusion that we need to change some prerequisites, concepts, strategies, and practices. 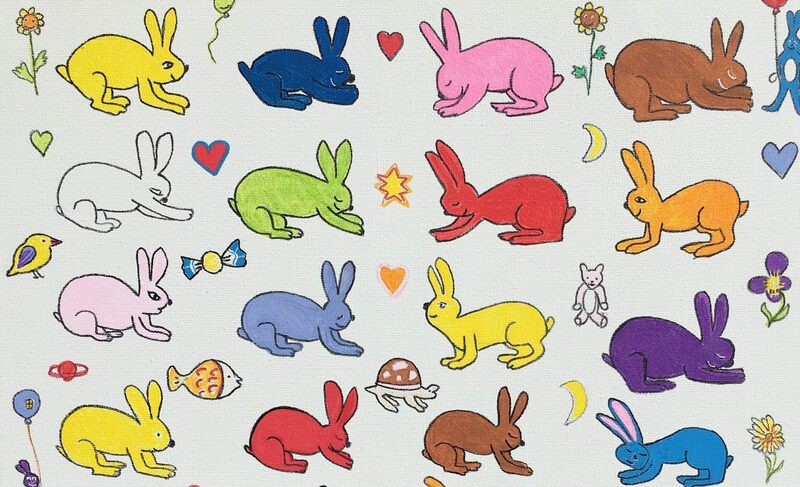 The situation as described demands new approaches, new paradigms and sense for cooperation. … Ayurveda has been one of the treasures of India. I welcome the ambition of the Indian Government to share it with us,” he said. 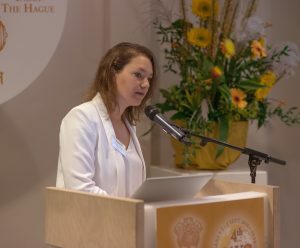 Amanda Mackintosh, member of the board of Task Force Health Care in the Netherlands presented the Dutch system of health care, elaborating on its strengths. She expressed her openness to collaborating with India and utilizing the wisdom contained in Ayurveda. Dr D. C. Katoch, Adviser Ayurveda, Ministry of AYUS. Photo Miep Bos. 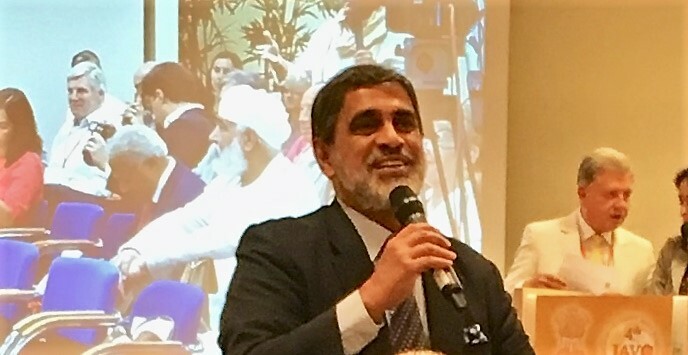 Dr. DC Katoch, Ayurveda advisor to the Government of India, and Dr. Geetha Krishnan, AYUSH representative at the World Health Organization, where he is the Technical Officer of the Traditional, Complementary and Integrative Medicine Unit, highlighted India’s readiness to collaborate internationally, with its huge infrastructure. 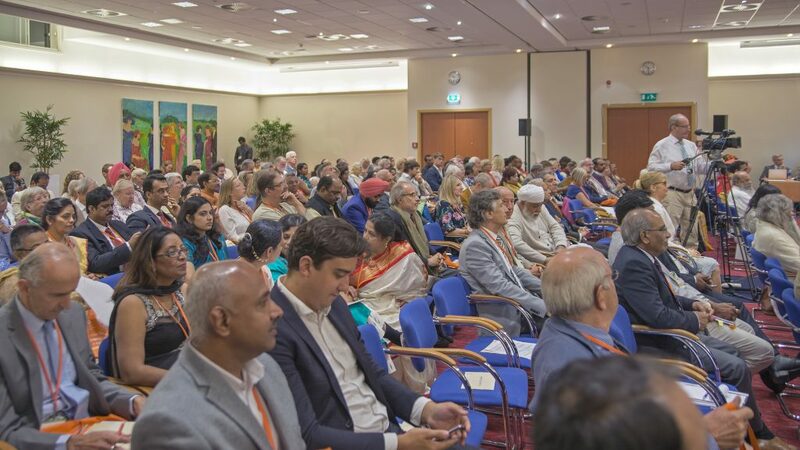 The seminar immediately followed the Fourth International Ayurveda Congress, which was held at the Holiday Inn, Leiden, on the weekend of 1-2 September. An estimated 300 delegates from 15 countries on 5 continents attended the Congress. Medical doctors practising Ayurveda, Vaidyas (qualified practitioners of Ayurveda from India), western Ayurveda practitioners, and research scientists presented their experience and scientific findings of preventing disease, promoting longevity, and treating chronic disorders with Ayurveda. H.E. 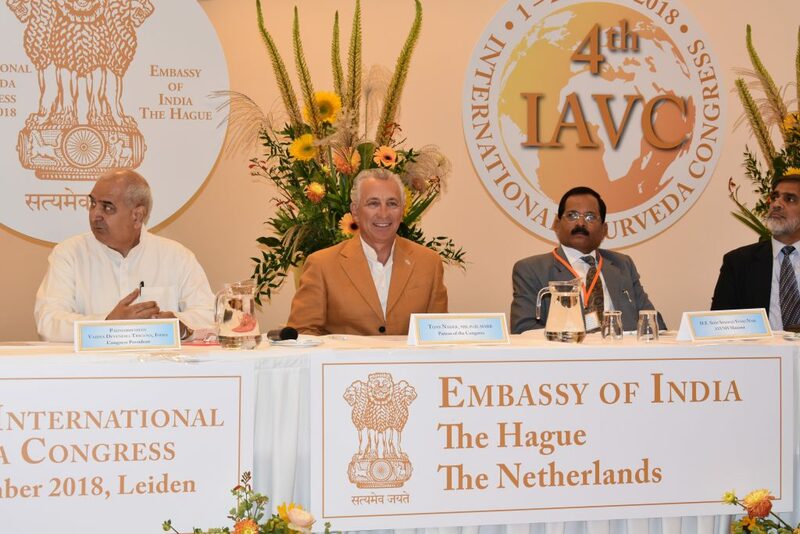 Shripad Naik, Minister of AYUSH, Government of India, and the Indian Ambassador to the Netherlands, H.E. Venu Rajamony, were honoured guests at the event. Dr Tony Nader MD PhD MARR was the Patron of the Congress. Padma Bhushan Dr Devendra Triguna, President All India Ayurvedic Congress was the Congress President. A highlight of the Inaugural Session of the Congress was the conferring of the Maharishi Dhanvantari Award jointly on Rajvaidya Padma Vibhushan Brihaspati Dev Triguna (posthumously) and his son Padma Bhushan Dr Devendra Triguna, and on Dr Tony Nader for their outstanding contribution to and achievements in the field of Ayurveda throughout the world. The Maharishi Dhanvantari Award is conferred in the memory of His Holiness Maharishi Mahesh Yogi, who established AyurVeda as a holistic, scientific system of natural health care. Maharishi’s initiatives throughout the world for over 50 years have been fundamental to the worldwide upsurge of interest in and enthusiasm for Ayurveda that we see today. The award is accompanied by a $10,000 prize. A galaxy of plenary speakers including medical doctors from Austria, the Netherlands, Germany, Switzerland, and Denmark shared their experience of the impact of Maharishi AyurVeda on heart health, arthritis, hormone balance, and ageing. In the Congress as a whole over 50 presentations were given on various topics focusing on the prevention and treatment of chronic disorders. A strategy and planning session was attended by leaders of various Ayurveda organizations in Europe and prominent physicians and researchers, including the rector of the Free Amsterdam University. The theme was bringing knowledge and practice of Ayurveda into mainstream health care, education, research, training, products, and services. One of the proposals at this meeting was to establish collaboration for research in Ayurveda between AYUSH and a university medical centre in the Netherlands, the University of Graz in Austria, and research institutes and universities in Australia. 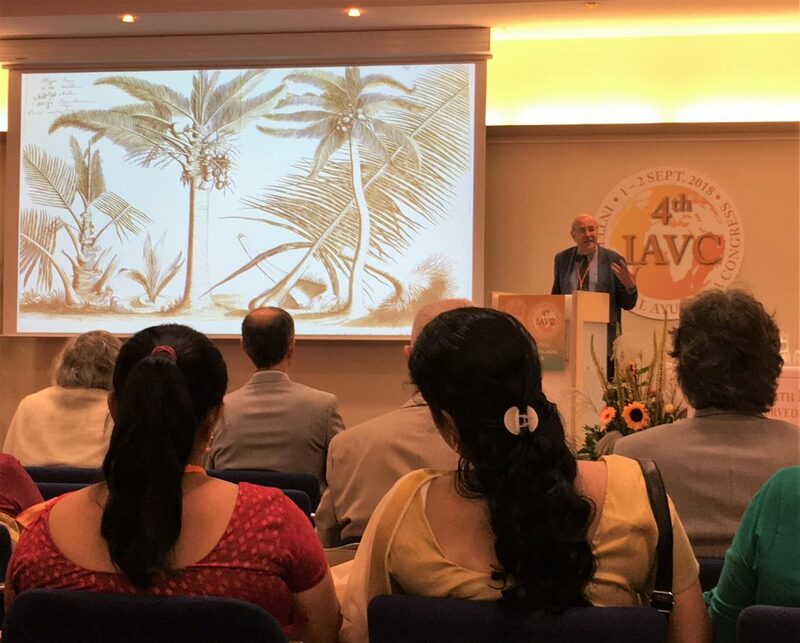 Ayurveda Congress Leiden: Hortus Malabaricus showed by Prof. Pieter Baas, photo Miep Bos. 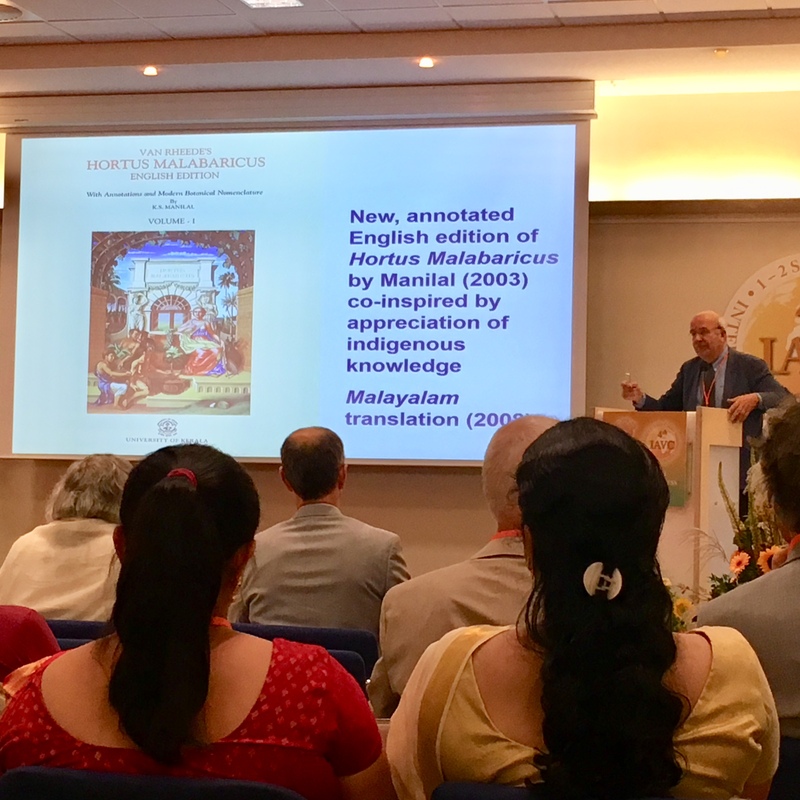 Professors Dr Pieter Baas, Dr Achuthan Menon, and Dr Annamma Spudich explored the historic relationship between the Netherlands and India demonstrated by the Hortus Malabaricus, a 340-year-old Dutch treatise. Hortus Malabaricus (Garden of Malabar) was compiled over a period of nearly 30 years and published, originally in Latin, in Amsterdam between 1678 and 1693 in 12 volumes. This treatise gives a detailed account of the flora of the Malabar region in South India, including copper plate engravings and detailed descriptions of 742 plants. Congress participants visited Leiden University Library to see the treasure treatise of Hortus Malabaricus and the botanical heritage of the Dutch Golden Age represented by herbarium collections, books, and botanical drawings, and enjoyed a tour of the Hortus Botanicus Garden, Leiden – one of the oldest botanical gardens in Europe. 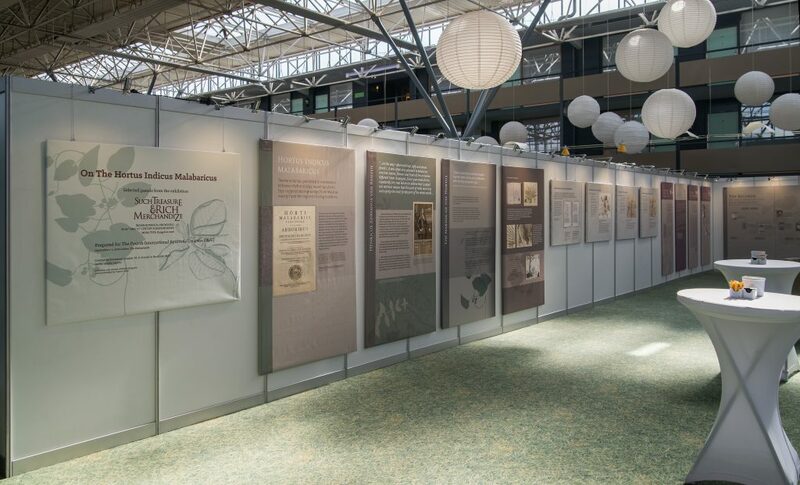 Citizens of Leiden enjoyed a Health Fair at the Congress featuring an exhibition about the Hortus Malabaricus by Dr Annamma Spudich of Stanford University, and other displays. The Health Fair included public talks about Transcendental Meditation, Yoga, the Ayurvedic approach to digestion, practical Ayurvedic health tips for daily living, and Aroma Therapy. All photos without the name of the maker and the Press Release are from the International Ayurveda Foundation, Vlodrop, the Netherlands. 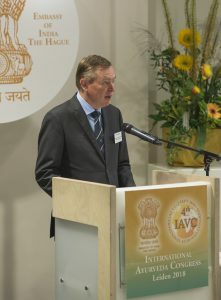 Speech of Minister Bruno Bruins, the Dutch Minister for Medical Care & Sports Bruno Bruins who was a guest at the seminar “India-Netherlands Collaboration in Healthcare, including Ayurveda” at Leiden, Netherlands. Tony Nader about the speech of minister Bruins at the Seminar in Leiden 3 sept. 2018. Large photo: Lecture of Prof. Pieter Baas, photo: Miep Bos.